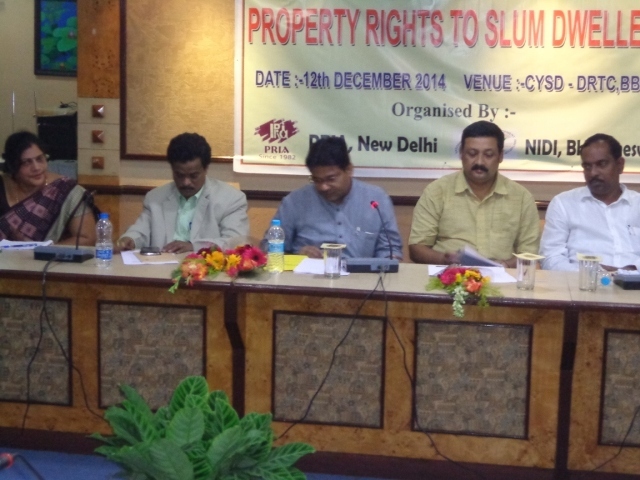 NIDI, Bhubaneswar in collaboration with PRIA, New Delhi organized a State level Consultation on Property Rights to Slum Dwellers on 12th December 2014 at CYSD, Bhubaneswar under the Chairmanship of Dr. Bhagaban Prakash. The purpose of the program was to create a forum to discuss the property rights of slum dwellers in the context of The Odisha Property Rights to Slum Dwellers and Prevention of New Slums Bill 2012, for “comprehensive redevelopment and rehabilitation of slums in the state both in terms of basic civic services and assigning property right to slum-dwellers and prevention of formation of new slums”, which got Cabinet approval in September 2012, but could not be placed before the State Legislative Assembly. The state government was committed to making the state slum-free and formulating comprehensive policy for it. The participants highlighted the issues of the slum dwellers relating to property rights and the slow progress with regard to enactment of the property rights legislation. The representatives of slum dwellers association claimed that beneficiary selection has not been made properly and the affected people are not aware about their rights under comprehensive redevelopment and rehabilitation of Mr. Saroj Kumar Samal, MLA, Dhenkanal in his address emphasized on the rights and duties of slum Mr. Ananta Narayan Jena, Mayor, Bhubaneswar Municipal Corporation briefed about the initiative taken by BMC towards providing basic facilities to the slum dwellers and also said that BMC provides around 400 sq. ft. houses to the slum dwellers under Rajiv Awas Yojana (RAY) with all civic facilities around it. A survey has been conducted in 436 slums of Bhubaneswar and DPR prepared accordingly, and there will be no eviction in Bhubaneswar, Mr. Jena added. He also said that in case of eviction for infrastructure development, the affected families will be accommodated in transit houses, proposed to be constructed for 6000 families, prior to their permanent rehabilitation. Mr. Puspendra Singhdeo, Minister, Housing and Urban Development highlighted the schemes and programs of State Government for welfare of slum dwellers. All need to join hands to make the Bhubaneswar city green and developed, instead of blaming the State Government, Mr. Singhdeo said. He also brought to the notice of the house that the State Government will bring the Bill afresh and the Government is open to any kind of suggestion regarding property rights of slum dwellers from all Mr. Ranjan Rout, Executive Director, NIDI welcomed the participants and gave the keynote address. 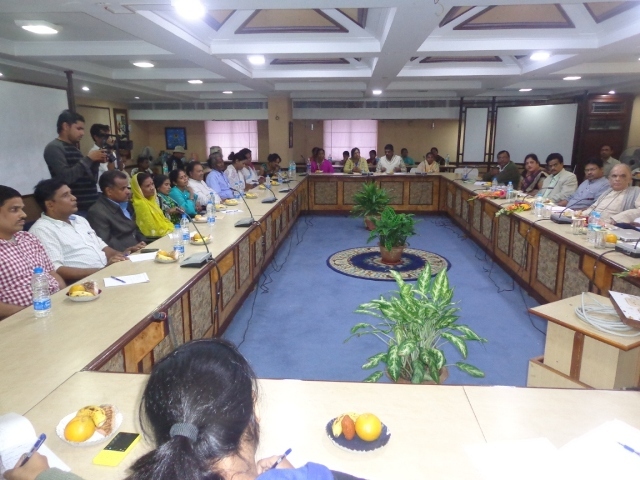 Dr. Piyush Ranjan Rout, Mr. Prafulla Dhal, Mr. Sankar Parida, President, OSPP, Mr. Raju Singh, President, HMS, Odisha, Mrs. Sanjukta Mahal, HMS, Mr. Mahendra Parida, CPI (ML), Meera Parida, representative of transgender association, Mrs. Sachala Panda,Secretary, ANWESAN and Mr. Sura Jena, President, Nikhila Odisha Basti Unnayan Mahasangha were the key persons spoke in the discussion. Mr. Arun Parida, Social Worker gave the vote of thanks.